If you choose to return your leased or Leadership Purchase PlanTM vehicle, you will need to arrange an end-of-lease vehicle inspection through our preferred vendor SGS. The inspection is free and takes about an hour to complete. An inspector will travel to a location convenient to you, such as your home or office. The inspection gives you a portion of the information you will need to properly close your account. It's important to set up your appointment and have the inspection completed in the last two scheduled months of your lease. You are responsible for any excess wear and use, which may be charged to your account. It's a good idea to be aware of any charges before turning in your vehicle. That way, you'll understand and be prepared when you receive a bill for these conditions. Having the inspection done well in advance of returning your vehicle also gives you time to take care of any needed repairs yourself. Can I schedule my lease inspection online? Yes, you can schedule your lease inspection online by visiting SGS. Please have your Acura Financial Services account number and VIN number available. Inspectors will not drive the vehicle, but they will need the keys to start it and test all electrical functions. Upon completion the inspector will print an inspection report and review the results with you. *SGS Inspectors are not privy to Honda Financial Services Excess Wear & Use or Damage Waiver contract terms, so please contact a Lease End Specialist at our Lease Maturity Center regarding next steps or possible actions. We recommend that you be present for this inspection. If you are present, the inspector will give you a copy of the report following the inspection. Shortly thereafter, you will also receive a Preliminary End of Lease Statement that outlines the estimated costs of any excess wear and use or damage, excess mileage, etc. No charges will be made to your account until after the vehicle has been turned in. The vehicle is as clean as possible, inside and out, but detailing is NOT necessary. All items are removed from the vehicle, including child car seats. Inspectors will not move or remove any items from the vehicle. All keys, manuals, original accessories, and any service or maintenance records are present. There is adequate space and light for the inspection process. 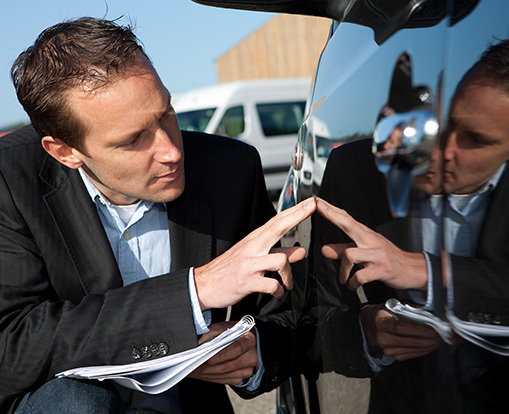 The Lease Maturity Center can direct you to the vehicle inspection provider in your area. You should arrange for an inspection about two months before the end of your lease. You can arrange for an inspector to travel to a location convenient to you, such as your home or office. You can schedule your lease inspection online by visiting SGS. Please have your Acura Financial Services account number and VIN number available. * Waiver reflected is for vehicle leases dated October 2013 or after. For specific benefit information on your current AFS lease contract, please log in to your AFS account and select End of Term. A loyal client is one who purchases or leases another new Acura or Honda automobile within 30 days prior to or after the turn-in date. Total amount waived not to exceed $1,500. If the vehicle requires repairs, consult a Client Services Representative prior to completing. If repairs are needed. we encourage you to use an authorized Acura facility to ensure that the vehicle is properly repaired with Genuine Acura Parts (as required by your lease agreement). Please be sure to save all repair receipts, as they will be required at vehicle return. If you prefer, you may instead return the vehicle without making repairs, in which case you will receive a bill for the cost of excess wear and use after your vehicle is turned in. Again, no charges will be made to your account until the vehicle is turned in.